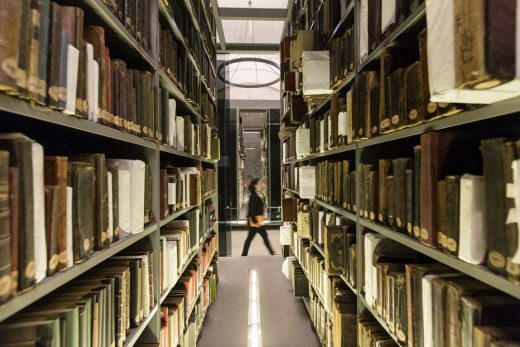 First founded in 1884, the State Library building was originally the soup kitchen and Caravanserai of a complex that included a kitchen, a primary school, a hospital, a madrasah and a hammam. 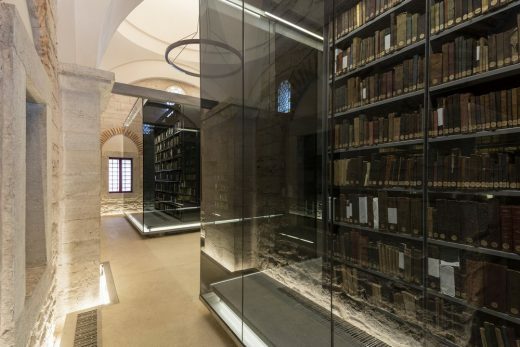 The library is a section of the Kulliyah of the Beyazıt Mosque- the oldest surviving imperial mosque in the city- built by Sultan Beyazıt II and completed in 1506. 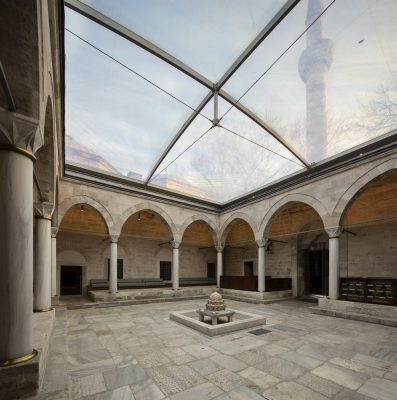 The complex (Kulliyah) spatially surrounds and defines the historic Beyazıt Square. 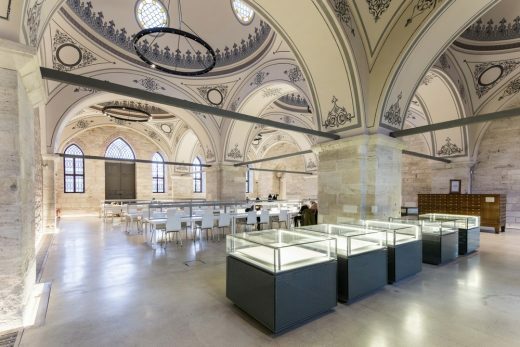 Adjacent to Beyazıt Mosque, the Library is located in the Beyazıt Square that is connected to the spine of the historical peninsula, Divanyolu, and is one of the most vibrant spaces in the old part of the city. 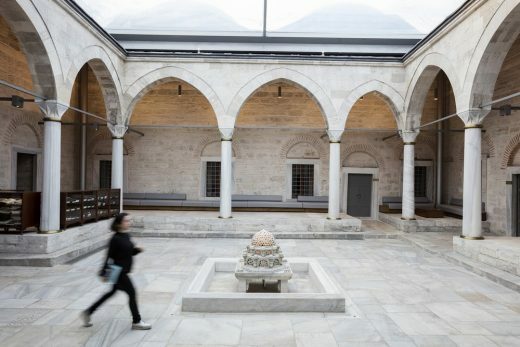 The quarter, where the State Library sits, is infused with historical connections of a literary nature; the old-book bazaar (bouquiniste) that is set in a courtyard leads toBeyazıt Gate, one of the main entrances of the Grand Bazaar. The front façade of the library backs the monumental plane tree under which is the traditional open air coffee shop serving since the Ottoman times. 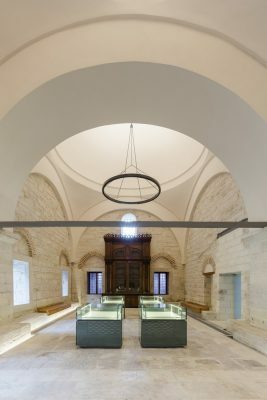 The exemplary updating and fine-tuning of the State Library involved the sensitive re-organisation of the interior and careful restoration of the building fabric with its prominent multi-domed roof. 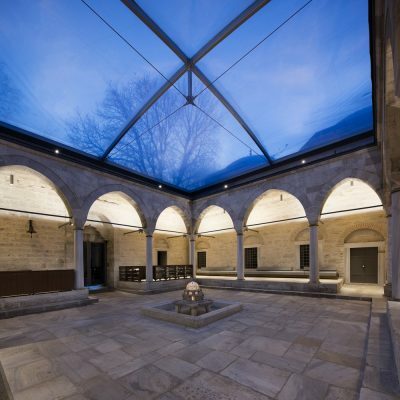 In place of the former concrete roof, Tabanlioglu Architects installed a light and transparent inflatable membrane structure which covers the courtyard, filtering the daylight and providing a controlled atmosphere. 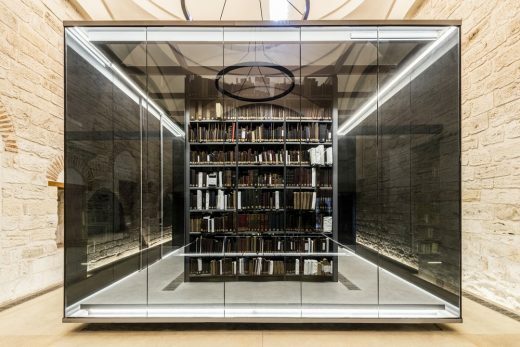 In the renovated shell of the building, the black glass boxes devoted to the manuscripts, stand as a monolithic object of awe that are of a stark contrast to their surroundings. 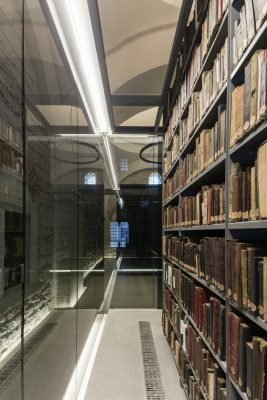 Lighting Design by studio Dinnebier, echoes the spatial and historical qualities of the complex, introducing geometries in harmony with its surroundings, while the soft lighting at the edges of the raised floor, that follows the wall contours introduce another layer of depth to the spaces. 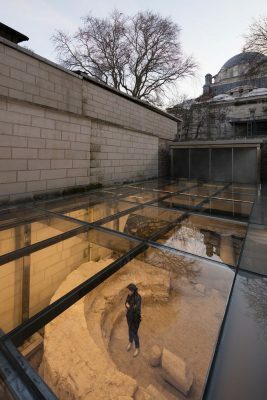 The flow through the building was modified in order to best serve its modern function with the main entrance now through the courtyard. A modest extension, respectful of the scale of the existing building, has been added to the northeast façade of the existing Library. 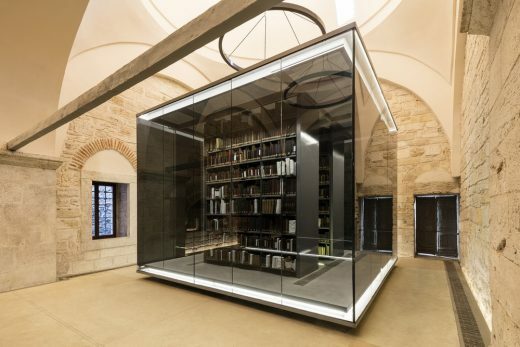 Modern Turkish publications sit on the second floor and periodicals on the first, while the ground level houses the rare book collection, publications in the Ottoman era and other Ottoman, Arabic and Persian manuscripts that are now kept in air conditioned transparent cabins exclusively designed to fit in the intense atmosphere while preserving the legacy. The ‘minimal intervention’ approach ensures the spirit of the place survives while modern facilities are grafted onto the historic fabric. The project aims further for environmental betterment, and urban regeneration of the public realm by reviving all the traces and capacities, principally the Beyazıt Public Square. 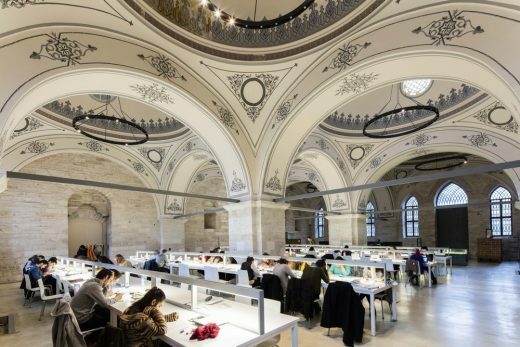 Tabanlıoğlu Architects has a long family tradition and is the culmination of over 60 years of architectural experience whose work today comprises a wide range of building types from housing, offices, mixed-use, public and cultural buildings to industrial projects and high-rises. Demonstrating professionalism based on rigor and know-how, the practice currently has offices in Istanbul, Ankara, Dubai, Doha and Londonand operates mainly in Turkey, MENA and CIS Countries. The firm has more than 200 architects; approximately 60% of the team are women. Tabanlioğlu Architects postulates that one of the big issues inherent in urban development is to create city spaces that are interactive to allow citizens to truly mingle; that in order to make better cities, buildings should be multifunctional and take inspiration from both ceremonial and informal public spaces. The practice strives for new efficiencies in terms of global and environmental needs, incorporating new technologies into their work. Their most recent awards include: WAF Future Office Project Award and MIPIM 2015 Best Office Award. In 2014, ESAS Aeropark received LEAF Award and International Property Award. In 2015, The Plan Awards selected three Tabanlıoğlu projects as the winners; Dakar Congress Center, Bodrum International Airport and Astana Train Station. RIBA International Awards for Loft Gardens and Bodrum International Airport projects in 2011 and 2013 respectively.